Jesse McReynolds has been an innovative musician for nearly 70 years. 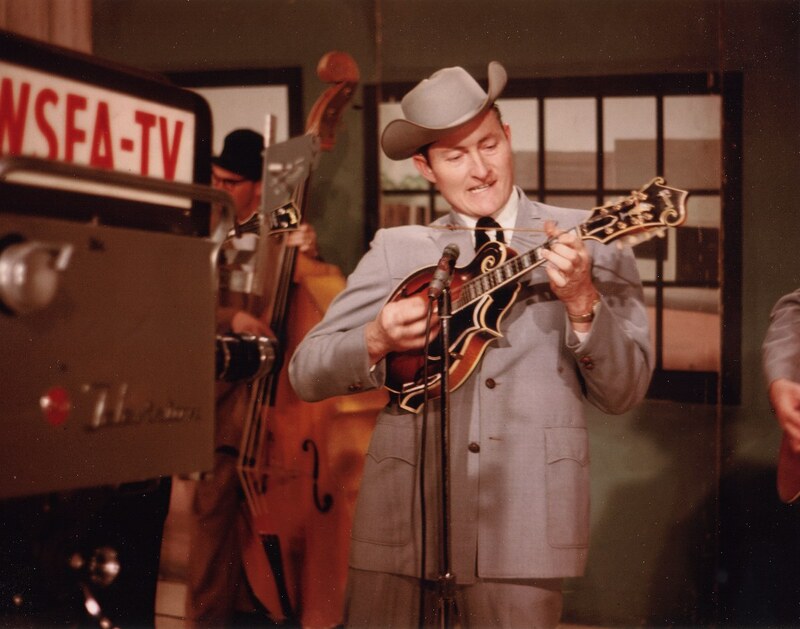 Born and raised in rural Carfax, Va., he and his brother Jim were the longest-running brother duo in the history of country music, playing together for 55 years before Jim’s passing in 2002. McReynolds created his own unique style of mandolin playing using cross picking and single string picking techniques. He has always been a trailblazer in mixing genres, and made albums featuring the songs of Chuck Berry, the Grateful Dead, and John Prine long before it was hip to do so. His grandfather played fiddle on the 1927 Bristol sessions and Jesse was featured playing the same fiddle on the recent Orthophonic Joy CD, a tribute to those sessions, reviewed in the Nashville Musician’s previous issue. Jesse celebrated his 50th year of performing on the Grand Ole Opry in 2014 and he continues to be a passionate and vital artist. NM: What were your earliest musical memories? JM: My granddad was a fiddle player, and my father played a little, too. He never played in public, but he showed me a few tunes. Music was our only entertainment growing up. We had one radio in the community, and it belonged to my brother in law. All of the neighbors would go to his house every Saturday night to listen to the Grand Ole Opry, and the music just stuck with me. I was in a car wreck when I was 14 and broke my leg, and went I got home from the hospital, I just sat on the side of the bed and tried to learn how to play fiddle. I don’t know how my mom put up with it, but she did! NM: How did you and your brother become professional musicians? JM: The two of us played around home and we’d go out on Saturday night and play in the churchyard and disturb the services. They’d invite us in, but we said, “We’re not good enough to play inside!” We had a cousin who played pretty good, and we just get 4 or 5 guys together and just started playing and singing up and down the road wherever they’d have us. While Jim went into the Army for a couple of years, I got on my first radio show, Norton, Va., on WMVA in 1946. It was me and a neighbor, who was a guitar player and singer. His dad had a motel, restaurant, and beer joint down the road and got me an electric guitar to play and he bought 15 minutes of time for us to play on WMVA. Jim was driving a truck before he went in the service, and when he came home I asked him if he wanted to try to play music for a living. He said, “Well, we can give it a try,” and we stayed with it. That was 1947. We were the only ones from our area who were able to make a living playing music. NM: When did you start playing the mandolin? JM: When my brother Jim came home from the Army he bought a mandolin. He played it and I was playing guitar. Somehow, I got to borrowing his mandolin a lot, and I loved playing it. After we got our first little band together, he said, “Why don’t you just play mandolin,” so we switched. First we called ourselves “Jesse and James and The Cumberland Mountain Boys,” but it was too long and complicated, so we switched it to Jim and Jesse. There was another group called the Virginia Boys, and when they quit playing, we started using that name so it became Jim and Jesse and the Virginia Boys. NM: Those radio shows must have been the best way to get a career going in those days. What happened next? JM: It was a regional thing, most stations would have about a 100 mile range. We always tried to plan ahead and be ready to make our next move to another place. We went from the Norton radio show to Wheeling and then Charleston, W. Va., where Grandpa Jones worked. Next, we left Charleston and went to Bristol, Va., to a local station where we had an early morning show. The station got sold and went off the air. Wade Mainer was looking for a band and we went with him to Forest City, N.C., where we played for about 6 months. We got pretty hungry down there, too, so we kept moving. Sponsors were important, and we would audition for different companies all the time, and that kept everything going for us. We had regional radio and television shows in north Florida and south Georgia, with Ford Tractor and then Martha White as sponsors. NM: When did you start making records? JM: We got signed to Capitol Records in 1952, and our first record, “Are You Missing Me,” came out in September, but then I got drafted three months later. I was out of the business for for two years, so when I came back in 1954, we had to just about start over again, but “Are You Missing Me” was still our biggest hit. NM: Did I hear correctly that you were Marilyn Monroe’s chauffeur while you were in the Army? JM: After I got drafted, I was sent to Korea. Charlie Louvin and I both served over there and played some music together. Marilyn Monroe had just gotten married to Joe DiMaggio, and they were on their honeymoon. Joe stayed in Tokyo and she came over to Korea on a USO tour, and I was driving a jeep for Special Services. After the main show, she and the Red Cross folks would go hang out with the troops for a while, and I was her driver. NM: What was that first Opry performance like for you? JM: Cohen Williams, President of Martha White, really helped us to finally make it to Nashville in 1964 to play on the Grand Ole Opry. It was a big break for us. Where else can you go when you get to the Grand Ole Opry? That’s not something you ever forget. Ernest Tubb brought us on the first time, and I will always remember that night. It’s a very humbling feeling to be on that stage where so many superstars have been standing for so many years. NM: What other mandolin players and musicians inspired you? JM: We called what we played hillbilly or country music. Bill Monroe was the only one calling it bluegrass back then! Bill was one of my favorite players, and then I got to listening to Jethro Burns, and Red Rector impressed me, too. He played with Carl Story and we did a lot of shows with them, and Red was very unique. He didn’t use a shoulder strap, he just held the mandolin in his arms and played it that way. NM: Can you talk about the development of your cross picking and single string style of mandolin playing? NM: For years, you have stretched musical boundaries by incorporating material from a wide range of writers and artists. How did the 1965 album of Chuck Berry songs come about? JM: We were with Epic Records at that time, and Billy Sherrill came to us with the idea. We found out later that Chuck Berry’s publisher had pitched it to a few other country artists, but we were the ones who said yes! Billy Sherrill gave me all of Chuck’s records to listen to, and I thought, if we’re going to do it, we’ll do it our own way. So we went into the Quonset Hut and cut “Memphis” and all the label people cam in and listened to it, and everybody started saying, “Well, this is something different!” We went on and cut the whole album and it’s still one of the most popular projects we’ve done. I’ve always been open minded about different types of music, and I like to listen to rock and roll or anything that sounds musical to me. NM: How did you come to do a recording session in Los Angeles with The Doors? JM: In 1968, I was visiting at my parents’ house and the phone rang and I answered it. The operator said, “Hollywood calling for Jesse McReynolds” and I thought it was somebody making a joke, but it was a producer named Paul Rothchild. He didn’t say who he was working with, but he said he had a session out in L.A. and needed a mandolin player. He said we’ll fly you out, put you up and pay you double union scale, and he also needed a fiddle so I got Jim Buchanan, who was playing with us at the time, and we went out there. When I got there, I found out it was for The Doors. I had heard of them but really hadn’t listen to them that much. It was a song called “Runnin’ Blue.” They put on the recording, and it had horns squealing and electric guitars, and I thought “Where do you hear mandolin on this?” Then right in the middle of the tune they stopped the rock and roll music and went into a hoedown type thing. Me and Jimmy overdubbed for a whole session, and it turned out pretty good. NM: You’ve had a long relationship with (musician/songwriter/producer) Carl Jackson. Can you talk about that a little? JM: Carl came to Nashville with playing with us for the first time when he was 14. He’s one the greatest guys in town, and he really cares about the music. He produced an album on Jim and Jesse for Rounder, “Music Among Friends” with Bill Monroe, Mac Wiseman, and Porter Wagoner and a bunch of guests. Johnny Cash’s name was on the album, but he ended up being out of town so we never got him on there. Carl’s a great producer, and a perfectionist. He really worked us hard on that one! Carl and Eddie Stubbs got me on the Orthophonic Joy project, and that was a great memorial tribute for my granddad and his fiddle. You know if Carl’s producing it, it’s gonna get done right. NM: What advice would you give a young musician starting out today? JM: Make your mind up what you want to do, and stick to it. Nothing’s going to be easy, you’re going to have ups and downs no matter what you do. I’ve had my share of that, and I still will, and it doesn’t fall in your lap like some people want to make it appear. If I could do it, you can do it. This entry was posted on October 19, 2015 at 7:47 pm and is filed under Uncategorized. You can subscribe via RSS 2.0 feed to this post's comments.